This brand new 3 bedrooms, located in spacious premises within palazzo Franchini Stappo is a very bright, large, heritage apartment (142 yards, 130 square metres). It is fully air conditioned and located in the center of Florence in a 'Firenze capitale' 1850 aristocratic building at the second ('piano nobile') floor. It has independent central heating as well as luxury features such as elevator for the main staircase, top end faucets and bathrooms (Devon & Devon), top quality beds and mattresses, very luxury finishing (Oak wood floor, high end kitchen) and NO cheap quality furnitures. It is high speed WIFI covered (Telecom Fibra, the fastest connection available in Italy. 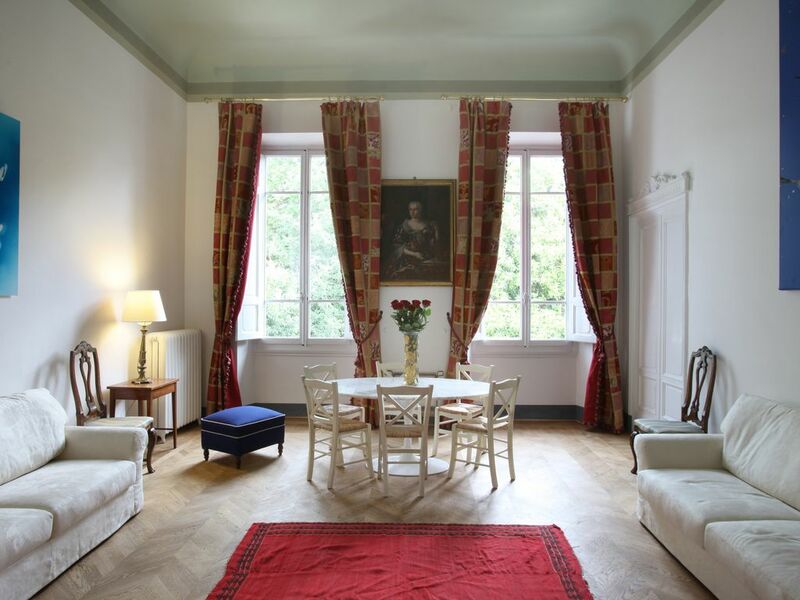 This apartment was until very recently the private home of a lady of local aristocracy and has now been completely renovated to add a touch of freshness to the classic style. The 2 large windows of the huge drawing room look into a private garden where several trees are hand in hand with a big magnolia tree which rises amongst eighteen century statues. Please be aware that even if the main staircase has a brand new elevator the apartment it is not wheelchair accessible and not suitable for people with disabilities. As a matter of fact, this apartment is laid out on 2 floors (both with air conditioning): there is a private internal staircase (as shown in the photos) leading to the 3 bedrooms and to 2 of the 3 full bathrooms. One full bathroom is located in the main floor were the drawing room and the kitchen are. Please note that the people sleeping in the second bedroom upstairs will have to, either share one bathroom with the first bedroom, either use the bathroom downstairs. As far as the third bedroom is concerned, it has an en suite bathroom. In addition to the 3 bathrooms, there is a half bathroom in the entrance available for guests. Historic heritage Palace: This very bright and spacious three bedrooms is articulated on two levels (both with air conditioning) linked by an internal private staircase which grants a quiet sleep even amongst a big group of friends or a large family. It is in a historical aristocratic palace in a fantastic location - next to the beautiful and much sought after Piazza d'Azeglio (one of the very few playgrounds for children in the green), and a short walk (0.6 mile) from the Duomo and popular shopping and restaurant areas of Sant'Ambrogio and Piazza Beccaria. It is possible to rent a private parking in the garden of the palace for 25€/day. The house is in the most beautiful residential area in the historical centre of Florence, known as Piazza D'Azeglio. It is a twelve minutes walk from the Duomo, Santa Croce Cathedral, the Synagogue, or Ponte Vecchio. It is a very Florentine part of the town; where real Florentines still live. As a matter of fact this property has been until very recently the private inhabitation of a lady of local aristocracy. Quite and Yet Lively Surroundings: The day market of Sant'Ambrogio where you can find all sort of delicious food is only a few hundred metres away. Twenty metres away you have one of the few organic food shops of Florence. If you do not feel like cooking, this is an area with plenty of charming little restaurants of all sorts. The world-renown Gelateria Veneta and Vivoli (ice cream shops) are only a few blocks away. Shops of all sorts are only a minute away and on the last week-end of each month the Flea Market is 250 metres away. Yet, the area is very quiet and the nights are unmolested by the touristic crowd. And if you want to climb on the hill of Piazzale Michelangelo is a 25 minutes walk to get on the top. Comfortable and Cosy:: It is very nicely and tastefully decorated throughout and has three (king size) bedrooms (all with air conditioning), three baths with showers, 4 toilets, and a huge, high ceilings (4,50 metres!) living room (also with air conditioning). The kitchen is large and fully equipped with new and large SMEG fridge, freezer, stove, oven, dishwasher and a new washing machine. The apartment also has wi-fi Internet on both floors for your convenience. It is located at the second (noble) floor and an elevator has just been installed and ready to use. This apartment is perfect for a group of people traveling together or for a family looking for room to spread out and privacy amogst them. As a matter of fact kitchen and drawing room are separated from the bedrooms by an internal private staircase which assures quite sleeping in every crowded or child-noise situation. An important factor leading to chose this property is that this property is always maintained up to a 'as new' conditions. As a matter of fact, the owner is very attentive to all details; regular in depth professional cleaning, frequent periodical renovations and interventions make this property always IDENTICAL to the photos you see on this site and appliances and fornitures are in excellent status. Fastest Internet wi-fi Connection available in Italy (telecom fibra) - Full Air Conditioning - Central heating- Washing machine - TV - Fridge and freezer - Gas Stove - Oven - Dish Washer. Former European Civil Servant at the European Commission, now retired to manage family properties. Speaks fluent English and French and he is used, from his former work, to deal with people of different cultures. Historic aristocratic palace in a real florentine area; one of the few spots with an authentic taste of real florentine life unspoiled by the crowd. toilet, shower, bidet, devon & devon luxury faucets ! toilet, devon & devon luxury faucets ! All bathrooms whith high quality tiles and tubs ( Devon & Devon brand). Very lively area full of shops and yet extremely quiet apartment in a very calm and residential street. A short walk (0,6 mile) from all the attractions and museums. Very lively and yet quiet area. Probably the best residential area in the historic zone. Close to a playground for children in the green. Maximum stay 4 weeks. children welcomed. all bedrooms with air conditioning. no air conditioning in the drawing room and kitchen. minimal age for renters 23 years old. Great apartment. Clean and spacious. Perfect location. Everything is within walking distance. Showers were nice, plenty of hot water. We were there in February and despite cold weather the flat was nice and warm. Owner provided good restaurant recommendations. many sincere thanks for you very nice review. The place was clean and nice. The location was excellent, and Guido was very accomodating. Two wumbs up. many thanks for your nice review. Great place to stay for a trip to Florence! Fondly welcome and apartment is beautiful. 3 bedrooms with king beds! Close to sights but far enough to be quiet. We were 3 couples there for 2 nights. Lots of space with big living room to visit but bedrooms private. Clean. Friendly housekeeper met us to show us in. Kitchen well equipped to make breakfast. We ate out other meals. many sincere thanks for your kind review. Our family of nine enjoyed this lovely home during our stay in Florence. It was very clean, spacious and perfectly appointed. Guido was extremely helpful and accommodating. We would certainly book this home again. Grazie! We were 6 adults and found the apartment to be perfect for our needs especially with 3 baths and 1/2 bath. Having access to a washing machine was also a bonus and Guido thoughtfully provides a drying rack. Everything is as pictured and the bathrooms are small but it is a historic home and they have been beautifully done. It was an easy walk to all of the sites, restaurants, and train station. I would not rely on a taxi to come if you text for pickup service same day especially early morning. We enjoyed our stay and would definitely book the apartment again. Next to the beautiful Piazza d'Azeglio, one of the very few children playgrounds in the green and a short walk (0,6 mile) from the Duomo and popular shopping and restaurant areas of Sant'Ambrogio and Piazza Beccaria. The house is in the most beautiful residential area in the historical centre of Florence, known as Piazza D'Azeglio. It is a twelve minutes walk from Santa Croce Cathedral, the Synagogue, the Duome or Ponte Vecchio. It is a very Florentine part of the town; where real Florentines still live. The day market of Sant'Ambrogio where you can find all sort of delicious food is a few hundred metres away. Twenty metres away you have one of the few organic food shops of Florence. If you do not feel like cooking, this is an area with plenty of charming little restaurants of all sorts. The world-renown Gelateria Veneta and Vivoli (ice cream shop) are only e few block away. Shops of all sorts are only a minute away and on the last week-end of each month the Flea Market is 250 metres away. Yet, the area is very quiet.